Every year, Bangor University supports students with sporting ability by offering a number of Sports Scholarships for students studying for a degree in any subject area. These Sports Scholarships are awarded to recognise and support sporting excellence and achievement. They are aimed at helping talented and high performance students to combine their academic study and sporting performance to assist them in achieving their full potential. Hannah Powell, Fraser Ashman, Luke Hobbs and Dean Horrell, School of Sports, Health and Exercise Sciences. The scholarship programme is part of a wider commitment to raise the profile and reputation of the University through sport. Additionally, each year Canolfan Brailsford awards a number of local bursaries to elite athletes from the local community. This year they were awarded to weightlifters Catrin Jones and Seth Casidsid. Catrin, 15, a pupil at Friars School in Bangor, is ranked number 1 in Wales and is a record holder at 40kg, 44kg and 48kg. She is the current British U18 champion and record holder, her aims are to compete at the Youth Commonwealth games in Western Samoa in 2015. 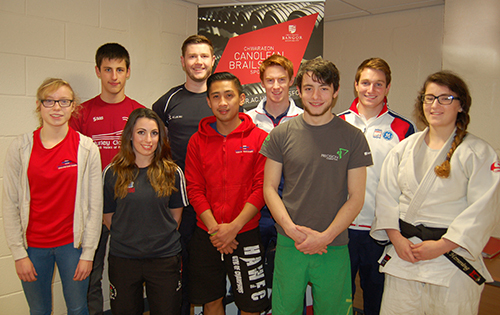 Bangor Psychology graduate, Seth, 25, is the Welsh Open Champion at 62kg and Current Welsh Champion at 56kg. He came 2nd in the British Senior Championships and his aims are to reach the Commonwealth Games in 2018 which will be held in Queensland, Australia.